Sacred Heart CMI Public School, Thevara evolved from a dream nurtured by parents, both local and NRI, to begin a CMI Institution in the heart of Ernakulam city. Nestled on the banks of the idyllic "Vembanad Lake", the school provides an ambience conducive to academic excellence and holistic development of the pupils. Sacred Heart vision and mission is to bring up caring, committed and confident youngsters who are fine-tuned to the human and spiritual values and who will take up their place as productive and responsible members of the society in future. Under the guidance of its leaders and staff over the period of time from its inception, the institution scaled greater heights, winning accolades in the academic and non-academic forums at the Inter School levels. In 2013, the Decennial Celebration was held. The green-rich-campus of the school is a point of attraction in the city life. A large variety of plants including medicinal plants decorates the richness of green in the campus. The Zero Waste=100 Marks Award by Manorama Online bestowed upon the school in 2014 indicated the remarkable crusade of the school against environmental issues. In its commitment to the mother earth in the line of green energy, school has established a solar power plant with the capacity of 70 kilowatts. The School has around 2000 students of the age group ranging from 6-18 years and 80 teaching staff and 30 non-teaching staff. SH, as it is known in the locality, is an ISA accredited school under the aegis of British Council which was granted for its international dimension in the curriculum. SH is also awarded ISO-9001:2008 certificate which ensures the quality management of the institution. 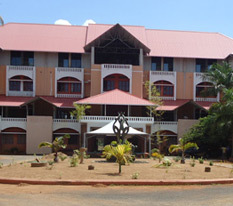 Sacred Heart CMI Public School is also blessed with a feeder section consisting of Pre-KG, LKG and UKG with a student strength of 350 and 30 staff. The success line of the school is the combination of the well motivated management, committed staff, disciplined students and cooperative parents.